This movie is depressing. Which is fitting, I suppose, as it's a movie about depression. 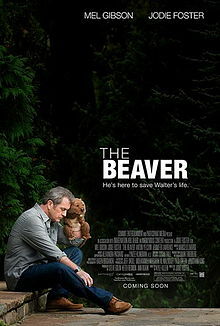 Mel Gibson looks absolutely horrible throughout the movie, which is good, since again, he's a man with severe depression. The Australian voice he adopts for the Beaver is really quite annoying and it sounds familiar, making me wonder if he's done it somewhere else before, but everything else about his part is really good. Perhaps because of his [very public] struggle with alcohol and the sort, it makes him all the more believable in this part. This movie is about more than depression, though. It's about a messed up family (aren't they all?) and their attempt at connecting with each other. It's just done in a very odd way (which I suppose is a given, considering the hand puppet on the cover). I'm not sure what prompted someone to write this movie, because it's very creative in a way, yet very predictable and traditional in a lot of other ways. Final word: A bit of a downer. Literally. Not for the masses.